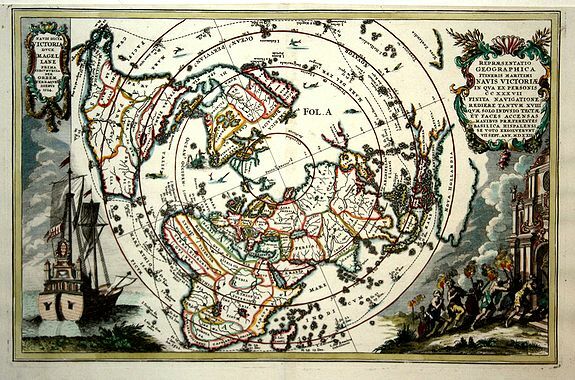 SCHERER -Repraesentatio Geographica Itineris Maritimi Navis Victoriae..
SCHERER, H. - Repraesentatio Geographica Itineris Maritimi Navis Victoriae..
Repraesentatio Geographica Itineris Maritimi Navis Victoriae.. - SCHERER, H.
Date : Munich, ca 1700. Size : 8.9 x 13.8 inches. / 22.5 x 35.0 cm. Description :This very graphic map of the world is presented on a north polar projection and depicting all of the world except the South Pole. California is shown as an island and the track of Magellan's voyage around the world is noted. There is a distorted portion of Australia noted as Nova Hollandia. At left is a beautiful engraving of Magellan's ship Victoria. Heinrich Scherer, professor of mathematics at Munich, was a devout Jesuit whose work emphasizes the Catholic hierarchy and the spread of Jesuit missions throughout the world. Condition : In good condition, the upper margin is a bit short.